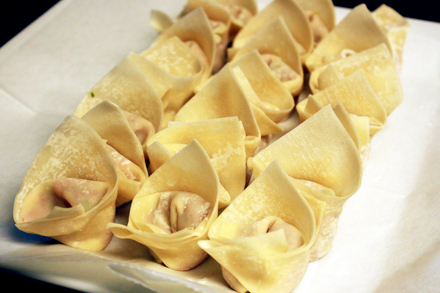 Wonton has a long history in Chinese cooking. They were first described as a “cake made by wrapping meat filling with dough” in a tome written around C.E. 544 called Qi Min Yao Shu (齊民要術), which can be loosely translated as Main Techniques for the Welfare of the People. Given their long history it is not surprising that wontons have spread throughout China and have evolved over the years. In northern China traditional wontons are made from pork stuffing enclosed in thinly rolled wrappers, which are made with flour and water. They are usually served in a broth as soup. Here they are known as “hundun” (餛飩), the same characters as recorded in the classic Chinese texts. Southerners on the other hand make their wontons with variety of ingredients such as pork or shrimp, and wrap them in egg noodle wrappers. They are often served in a soup with or without noodles. The Cantonese also serve them deep-fried covered with a sweet and sour sauce. These are the forms found in most dim sum restaurants and are familiar to many Americans. In the Cantonese dialect they are known as “wonton” (雲吞). In the neighboring province of Fujian they are better known as “bianshi” (扁食) and are sometimes stuffed with fish paste. But the most exotic way of serving wontons is Sichuan style. They are boiled, drained and served in a spicy chili oil sauce. This dish is known as Chili Oil Wonton (紅油抄手). Here wontons are called “chaoshou” which can be literally translated as “arm fold” because the folding technique makes them look like folded arms. I’d like you to try this version by making the recipe below. It is a perfect dish for using the Spicy Chili Oil from my last post. Although store bought chili oil is quite acceptable, my homemade version adds layers of complex flavors. If you decide to try this dish adjust the amount of chili oil to your tolerance level. Otherwise the oil can wreak havoc in your digestive system. Oh by the way, Song Jiang is rescued in the nick of time by his friends and avoids the terrible fate of becoming a human wonton. Heroes never die. 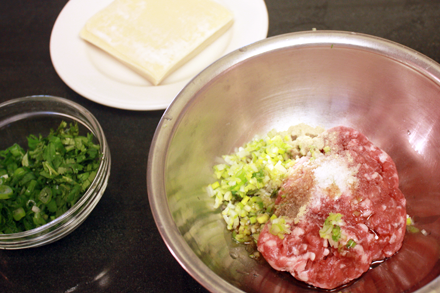 Combine all the pork stuffing ingredients together and mix well. Set aside. Put about one teaspoonful of the pork stuffing in the center of the wrapper. Turn the wrapper so that the corners are facing up and down and left and right. Lift the bottom corner and curl it over the stuffing, then tuck it behind and slightly under the stuffing. Next fold the left corner to the middle of the dumpling. 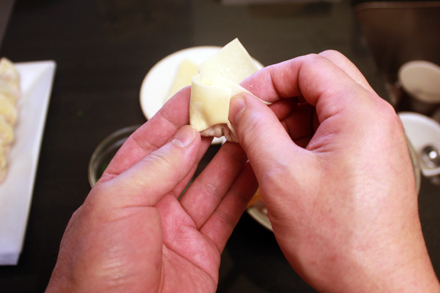 Fold the right corner to the middle so that it slightly overlaps the left corner then press to seal. This recipe yields about 20 to 25 wontons. Combine all the chili oil sauce ingredients together and mix well. Divide the sauce into four bowls and set aside. Put about two quarts of water in a three-quart stockpot. Heat until it starts to boil. Add the wontons to the pot. Boil the wontons for about three minutes so that the stuffing is cooked through. Drain the wontons thoroughly and divide them equally into the bowls with the chili oil sauce. Garnish with chopped scallion and cilantro and serve immediately. Lovely recipes, Kian, but what have you done to the web layout? I can’t copy the recipes anymore for use on my home computer. They come out in a long string just 15 or so characters wide–very, very inconvenient. Please have mercy on us low-tech users. Thank you for the very informative comment. I’m glad you enjoy the recipes on Red Cook. I am, however, a bit confused by your problem of copying the text. There has not been any changes made to the HTML layout of the articles. In fact I just tried it a few minutes ago and was able to copy the text properly. I have been looking for a good technical solution of isolating the recipes so readers can print them separately. I hope we can come up with a good solution for enhancement soon. 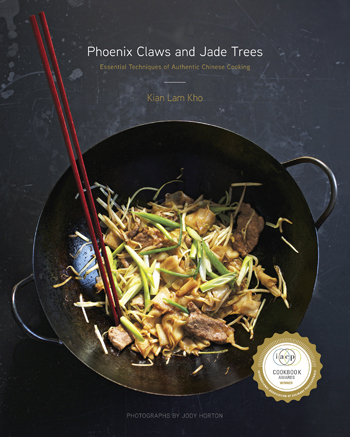 This was really a great read and the recipe for that chili sauce looks incredable. Im definitely going to try this tonight. I love how you provide history and information about many of the dishes. 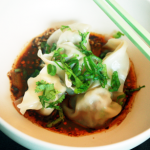 I love the history of wontons written here, and your recipe of chili oil wontons is very good. 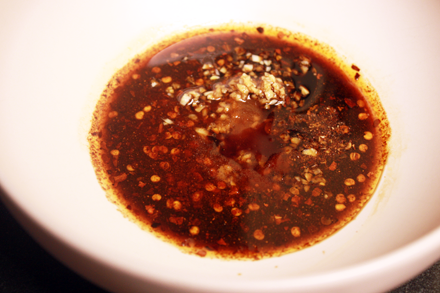 Can’t wait to try your Sichuan chili oil recipe – makes my mouth water! 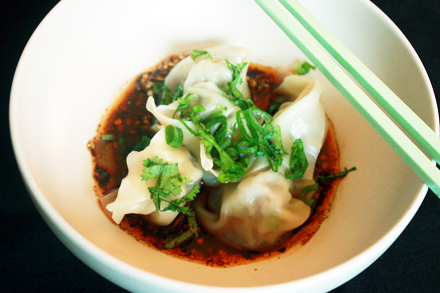 Oh, and I sometimes would mix in tahini sesame paste in my chili oil wonton sauce – for a delicious and creamy version! I’m glad you enjoy the post. I love Sichuan spicy wonton very much as well. Yes, a little bit of sesame paste would work really well. I would however recommend using Chinese sesame paste, which is made from toasted sesame, rather than tahini paste for a nuttier flavor. Yes Chinese sesame paste, that’s what I meant to say 🙂 I love Chinese sesame paste as I grew up eating Taiwanese cold noodles with sesame sauce. I made these wontons twice this weekend and they are fantastic. The sauce is simple amazing. However, I want to ask about a step that my aunt says is crucial to dumpling/wonton making, which is to scoop the meat into a ball with your hand and continuously smack the meat down into the bowl. I find that this step produces a nice firm consistency for the meat. It’s hard to describe in writing but I wanted to ask whether you were familiar with this technique.